As noted earlier (http://bygl.osu.edu/node/525) there are two common tar spots of maple seen in Ohio. One, that occurs commonly on silver and red maple results in dense, tarry spots caused by the fungus, Rhytisma acerinum. A second tar spot disease is typically found on Norway maple, with multiple tiny tarry spots that eventually coalesce into a larger spot, not quite as “tarry” but nonetheless black in color, caused by the fungus Rhytisma punctatum. Recently, while out on a bygl-alert photo-foray into nurture and nature, I realized there were symptoms I had not noticed before. Plant pathologists and diagnosticians oft talk of symptoms and signs. Signs are the visible presence of the pathogen, in this case the wavy, raised black “stroma”, the mycelium that is made up of microscopic hyphae of the Rhytisma fungus. This is below shown on what is a Rhysisma acerinum infection on what is apparently a Freeman maple, a cross between silver and red maple. Symptoms are the response of the infection to the plant cells by the fungus. I have noticed in summer, the symptom of the yellowing of leaf tissue (symptoms) around the developing “punctated” stroma (symptoms) from Rhytisma punctatum on Norway maple. What I had not noticed or at least mentally processed until a walk in Wooster recently was the extent of the late season symptom of an intense yellow halo around the stroma of this fungus, or the tendency of part of the leaf falling out of the middle of the stromal “spot”. Eureka. 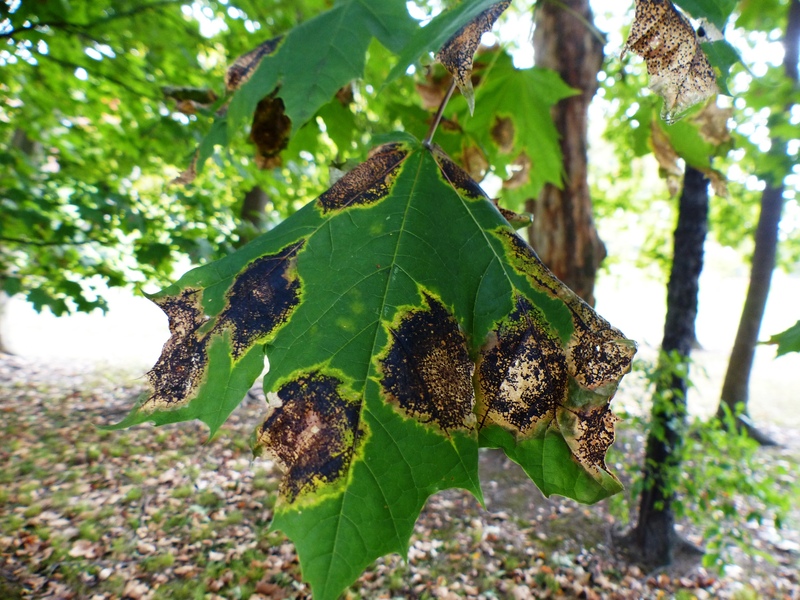 Bottom line: tar spot of maple is still considered mostly a late-season, cosmetic problem, though Rhytisma punctatum infections can result in considerable leaf drop on Norway maples. Fungicides are rarely used. Raking up infected leaves, which would otherwise harbor the pathogen overwinter and serve as a source of new infections next spring, can help limit tar spot next year.